Great Southern Demolition, Inc. was started in 1996 by Emile “Red” Barnes. After seeing a clear need for developing a higher standard in the Demolition industry, Red began developing new standards for everything from job site safety, to cleanup policy, to proper demolition technique. 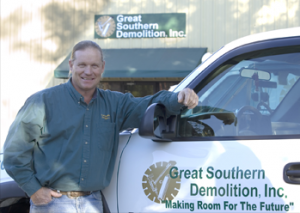 Years later, Great Southern Demolition has become the company of choice for many of the southeast’s top contractors and construction companies. By utilizing our proven techniques, expert staff, and hard to acquire demolition equipment, Great Southern Demolition has become the company to call in all cases dealing with demolition and cleanup, concrete sawing and core drilling, and even large machinery dismantling and removal. Great Southern Demolition takes pride in its ability to quickly remove everything from a single wall to an entire building while leaving nothing behind but a clean ready-to-go work area and room for the future. If there is something standing in the way of your construction project, give us a call today! Our large staff means on-demand availability and emergency response when necessary. Best of all, we can save you days, weeks, and even months of costly takedown and cleanup time on any project because we have the full time staff and all of the specialty equipment on hand and can be ready to go when you are – at a price that can’t be beat! Give us a call today and tell us about your project!